"He faced the problem of having a broke country, an empty treasury, and a lot of very rich citizens with full coffers. ...Crown Prince MBS found a solution. 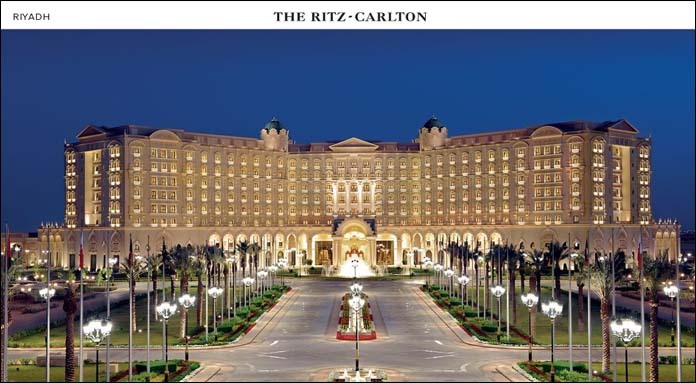 He rounded up hundreds of the wealthiest people in his Kingdom, placed them in the posh five-star hotel Ritz Carlton in his capital Riyadh, and told them to cough up the dough." The best solutions to difficult problems are simple. The Columbus Egg. The Gordian Knot. The Procrustean Bed. So many people strained their fingers trying to untangle the messy knot, until Alexander came and slashed it open with one fine stroke of his mighty sword. Wise men vainly tried to make an egg stand upright on its end on the table, until Columbus smashed one end. Procrustes solved the problem of the great diversity of population height-wise, by chopping off the legs of the tall and stretching the legs of the short. 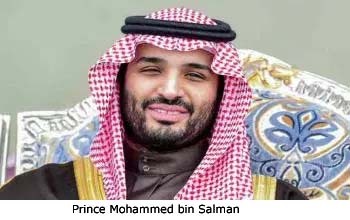 Now the glorious, if a tad too long, name of the Saudi Crown Prince Muhammad bin Salman (or MBS) should join the list of the great solution-makers. He faced the problem of having a broke country, an empty treasury, and a lot of very rich citizens with full coffers. Trump faces a similar problem; in the US, the top dogs have the whole hog, while the state is in multi-trillion debt. Just three well-to-do gentlemen—Jeff Bezos, Bill Gates and Mark Zuckerberg—have as much in their coffers as all the ordinary folk. The annual deficit is about $400 billion; the Rockefellers would not even notice if this paltry sum went amiss from their holdings, estimated at well over a trillion dollars, that is twelve zeroes after the first digit. The Greeks have it even worse: they are in debt, biting the bullet of austerity, while the money the Greek state borrowed has lined the pockets of the rich. The problem is universal. Everywhere, from the UK to Russia and from Brazil to Greece, it’s the same: the state coffers are empty, politicians prescribe austerity for the people, while a few rich guys enjoy the fast growth of their untaxed capital. Now, we know that, but what will you do about it, smart guy? Will you bite your mustache? Will you complain, in sotto voce or loudly, or just drink some cold beer to forget about this unhealthy fact of life? You know that you are not allowed to tax the rich people, you can’t stop them moving their capital offshore, you should not even utter such hateful words as it may be found anti-Semitic. It happened to Trump: when he attacked bankers in his election campaign, he was immediately called an "anti-Semite." Crown Prince MBS found a solution. He rounded up hundreds of the wealthiest people in his Kingdom, placed them in the posh five-star hotel Ritz Carlton in his capital Riyadh, and told them to cough up the dough. When they laughed in his face, he called for torturers to begin, Mafia-style, his extortion racket. The Daily Mail, in an exclusive report, tells us that “the Saudi princes and billionaire businessmen arrested in a power grab earlier this month are being strung up by their feet and beaten by American private security contractors. The arrests have been followed by ‘interrogations’ which a source said were being carried out by ‘American mercenaries.’ They are beating them, torturing them, slapping them, insulting them. They want to break them down,"’ the source told DailyMail.com. The torture in the glamorous hotel had been reported by one of best old-hand journalists in the Middle East, David Hearst. Several detainees were taken to hospital with torture injuries, he writes. There is a vast difference between "incredible" and "impossible," and the princes of Saudi Arabia learned by their own experience that though it is incredible that these worthies, pillars of society, owners of great hotels in London and film companies in Hollywood would be tortured, it was by no means impossible. The wealthiest Arab of all, Prince Al-Walid bin al-Talal, a billionaire 18 times over, an “important partner” to Bill Gates, co-owner of 21st Century Fox and Twitter, of Paris’ Hotel George V and London’s Savoy Hotel, inter alia, had been hung upside down, Mussolini-style. Hundreds of other princes and gentlemen were tortured, too, until they agreed to surrender their ill-gotten assets, 70% of all they have. As I write, and as you read these lines, the torture goes on, and so far MBS has already milked his victims of hundreds of billions $$ worth of cash and assets. “An Extortion racket,” you’ll exclaim. Perhaps MBS watched The Godfather in his impressionable youth and was impressed by the efficiency of their methods. However, he has solved, or rather is in the process of solving, the problem of solvency. Perhaps this is the method to be advised to Trump and Putin, as well as to other leaders? If the neoliberal dogma forbids taxing, if the offshore are sacred, what remains for a diligent leader but a plush five-star hotel and a band of experienced torturers? Tom Friedman does not use the word “extortion,” saying that [MBS’s] “government arrested scores of Saudi princes and businessmen on charges of corruption and threw them into a makeshift gilded jail — the Riyadh Ritz-Carlton — until they agreed to surrender their ill-gotten gains.” No condemnation at all! Can you imagine what he would say if Putin were to arrest his oligarchs “until they agreed to surrender their ill-gotten gains”? I believe one line in Friedman’s eulogy, saying that the Saudis are content with the extortion act: “the mood among Saudis I spoke with was: 'Just turn them all upside down, shake the money out of their pockets and don’t stop shaking them until it’s all out! '” Moreover, I am sure the Americans would applaud if their billionaires were to get the MBS treatment. Not only the media is supportive of the extortion scheme. US Treasury Secretary Steven Mnuchin told CNBC: “I think that the Crown Prince [Mohammed bin Salman] is doing a great job at transforming the country.” President Trump blessed MBS along similar lines. Not a word of condemnation came out of President Putin, either. Even Al Jazeera, though reporting the extortion in a matter-of-fact way, didn’t make too much out of it. There is a veritable conspiracy around the MBS actions, a conspiracy embracing the media and governments. He kidnapped the Lebanese Prime Minister, placed him under arrest, took away his telephone and watch, forced him to read on TV a resignation letter composed by MBS people — and the response of the world has been subdued. He bombed Yemen, causing hundreds of thousands to die of cholera and famine, and the world does not give a damn. Do you remember the response when the Russians bombed Aleppo? None of this indignation accompanies MBS’s war on Yemen. But the blanket of silence covering the Extortion Racket beats all. Usually, the global media mainstream system propagates and amplifies the news in a game of rebounding agencies that indirectly end up also to maximize headline sales, wrote the Italian journalist Claudio Resta. But in this case, the important and spectacular news made no headlines. In our Society of the Spectacle, failing to exploit the “spectacular” is a waste of the most valuable resource for the media. The potential for a great spectacle is all here. The arrest of dignitaries and princes of blood, including the famous Al-Walid bin al-Talal, well-known investor and Bakr bin Laden, brother of the most notorious Osama would normally feed the media for days. Add to it the marvelous setting of the glorious hotel on the verge of the desert. Make it even more dramatic by opening rocket fire on the escaping helicopter of Prince Mansour bin Muqrin, killing him and the other dignitaries who tried to flee. Such a story, so brilliant and spectacular, with the color and costume of a Middle Eastern monarchy, could sell newspapers for a week at least. But it was followed by deafening silence. The same media that overwhelms us with a flood of details and opinions in a case of human rights violations in Russia or China, in this case shows off an Olympic indifference to the fate of the princes and billionaires, unjustly and arbitrarily arrested and tortured in a country of no constitution or Habeas Corpus. The United Nations also joins in the conspiracy of silence. This is probably the most unusual aspect of the story, reminiscent of The Dog that Didn’t Bark by Sir Arthur Conan Doyle. In that Sherlock Holmes story, a dog did not bark during the night when a racehorse was removed from a stable, and that indicated that the thief was the dog’s master. In the case of MBS, the media dog keeps silent. It means that its mighty mega-owner, whom I called The Masters of Discourse, allowed and authorized the racket. We witness a unique media event, bordering on revelation. How could it be that a prince of a third-league state would be allowed the license to kidnap prime-ministers, kill princes by ground-to-air missiles, keep and torture great businessmen and dignitaries with impunity and the media would keep mum? Is it fear of the robber barons that the example of MBS extorting billions from his super-rich will be picked up and acted upon in their own lands? Perhaps. Or, is it more likely that The Axis of Goodness: Trump, Netanyahu and MBS, and the force behind them, that decided to free the hands of the strong-willed prince, who promised to surrender Jerusalem and present Palestine to the Jews in perpetuity? This was the offer of the old Saudis, who became the lords of Arabia because of their willingness to satisfy Jewish desires. For there were equally, or even more prominent Arabian lords and dynasties, with a better claim to rule the peninsula. The Saudis were the only ones ready to give up Palestine. And they were treacherous enough, as they already betrayed their Ottoman masters during the Arab Revolt of Colonel Lawrence. The so-called Trump Peace Plan, discussed and charted by Jared Kushner and MBS, contains the surrender of Palestine, giving up on the Right of Return of the 1948 refugees, giving up Palestinian sovereignty, giving up Jerusalem. Palestinians will pay, and the Jews and the Saudis will share the spoils. MBS has to suborn Mahmoud Abbas and the PNA, not an impossible task. Abbas has no mandate, and he rules by Israel’s permission. But he also has to suborn Hamas, otherwise Gaza will remain a thorn in the flesh. This is the reason for the reconciliation efforts between Gaza and the West Bank, Hamas and Fatah managed by Egypt. These efforts meanwhile are not spectacularly successful. Hamas agreed to reconciliation hoping to improve the lives of Gaza's much-suffering residents. Fatah was supposed to lift sanctions, to allow electricity to pour in, and people to enter and leave via the Rafah checkpoint. However, the sanctions remain in place, life is as miserable as it ever was, and now the PNA demands reinstalling thousands of its people fired in 2007. It would lead to firing thousands of Hamas appointees. And worse, the PNA calls for the disarmament of Hamas military wing, Izz ad-Din al-Qassam Brigades. This is plainly impossible. Instead of lifting sanctions, the PNA demands surrender, and blames Iran for Hamas intransigence. Azzam al-Ahmad, the head of Fatah’s delegation for Palestinian reconciliation, said Iran is the “number one sponsor” of division between Palestinian factions. He said that on the Saudi TV channel al-Arabiya. Iran is the main (if not the only) hindrance on the way of the Kushner-MBS plan. This partly explains the Saudi fury. Iran’s “supreme leader is the new Hitler of the Middle East,” said MBS to Tom Friedman. “But we learned from Europe that appeasement doesn’t work. We don’t want the new Hitler in Iran to repeat what happened in Europe in the Middle East.” MBS pinched these words from a Netanyahu UN speech, but he refrained from referring to the source. Iran blocks MBS’s plan to sell Palestine down the river, it blocks MBS’s war on Yemen, it blocks the takeover of Syria. Really, a new Hitler! But what about the Russians, Iran’s allies in the Syrian war? The Russians decided to keep out of these events. During the historical recent visit of King Salman and his son MBS to Moscow, apparently the guests explained their ideas to their host. They promised to keep the price of oil up, and this is important for Russia. When Saudi Arabia dropped the price of oil in 1980s, the USSR collapsed. Now, with the high oil price, Putin has decided to pay 10,000 roubles, ($150) per month to each family upon the birth of their first child. Apparently, the Saudis agreed to the Russian presence in Syria, too. Putin is a man of reason; he is satisfied with half a loaf, he is not overreaching. He learned the lesson of the Iliad, of the Greek and Trojan Princes who could have had almost all they wished – Greeks could have had Helen and a rich ransom, the Trojans could have allowed the Greeks to escape – but they reached for more, for total destruction of their enemy, and eventually they lost everything. Simone Weil wrote: “The tempered use of force, indispensable to the escape from its [force’s] machinery, would demand superhuman virtue, as rare as steadfast dignity in weakness.” This is Putin, in both his tempered use of force and in his steadfast dignity in weakness. However, while Russian policies differ from Western ones, the Russian media was incorporated into the Masters of Discourse’s domain many years ago. Putin succeeded in partially releasing some TV channels from their clutches, but in general, the Russian media follows the same guidelines as the Western media. An anti-Zionist article, a critique of Jewish rule in Palestine has as little (or less) chance to appear in Izvestia, as in the NY Times. An honest coverage of Gaza blockade is equally impossible on the CNN and on Russia 1st Channel and the RT. Now, the critique and discussion of the KSA events in Russia has been blocked. The same people who block discussion of Israel/Palestine now block the discussion of the KSA crisis. Thus, Iran and war-weakened Syria are all that stand in the way of a decisive Jewish victory in the Middle East. If a hundred years ago, the Jews pushed the unwilling US into WWI as a payoff for the Balfour Declaration, probably now they can repeat it to railroad the Kushner-MBS peace plan over Palestinian heads. For over this hundred years, the Jewish positions in mind control have only improved, via Facebook and Google. Their plans are likely to misfire, as all MBS plans did. There was nothing he yet succeeded in achieving, from pressuring Qatar to vanquishing Yemen. A lot of blood and a lot of money will flow, adding to miseries in the Middle East and elsewhere. The only satisfaction is that now you know who owns the dog that did not bark.